How to interpret in philosophy the common but enigmatic relation between knowledge, ontology and semantics? The “linguistic turn” in philosophy, the birth of philosophy of science and of philosophy of language, from the beginning of twentieth century until today, have given new energies to such a debate in western thinking, but this question is much more ancient. From a certain point of view, Aristotle’s ontology, in continuity with Platonic thought, is wholly a semantic ontology: in a systematic and pervasive way Aristotle researches the structures of the world – of the being – and of knowledge employing the structures of language. In this way the philosophical reflection on nature and on human being becomes the reflection on how language works and on how language organizes knowledge. This book, which mixes analytical and continental styles of thought, collects essays on the complex relation between science, language and ontology, written by scholars experienced in different fields of philosophical research: philosophy of science, philosophy of language, logic, ethics and philosophy of mind. 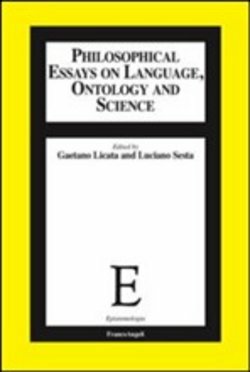 Dopo aver letto il libro Philosophical Essays on Language, Ontology and Sciences di ti invitiamo a lasciarci una Recensione qui sotto: sarà utile agli utenti che non abbiano ancora letto questo libro e che vogliano avere delle opinioni altrui. L’opinione su di un libro è molto soggettiva e per questo leggere eventuali recensioni negative non ci dovrà frenare dall’acquisto, anzi dovrà spingerci ad acquistare il libro in fretta per poter dire la nostra ed eventualmente smentire quanto commentato da altri, contribuendo ad arricchire più possibile i commenti e dare sempre più spunti di confronto al pubblico online.